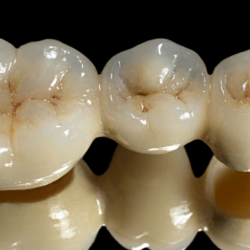 What are Dental Crowns and also Tooth Bridges? Both crowns and many bridges happen to be fixed prosthetic devices. In contrast to removable devices such as dentures, which you can remove and clean daily, crowns and bridges are cemented upon existing teeth or perhaps implants, and may only be removed by a dentist. They are crafted from Porcelain or an extremely hard glass. We may recommend Emax Empress porcelain for anterior esthetics or Zirconia crowns for posterior teeth. All our crowns are produced in Melbourne leading dental laboratories and these restorations provide exceptional esthetics and strength. Even though crowns and bridges can survive a lifetime, they do sometimes come loose or fall out. The most essential step you can take to make sure the longevity of your crown or bridge is to practice very good oral hygiene. A bridge can lose its support if the teeth or bone holding it in place are damaged by dental disease. Keep your gums and teeth healthy by Brushing with fluoride toothpaste twice a day and flossing daily. Unity Dental is a major provider of excellent dental services in Melbourne. Our aim is to achieve the highest standard of dental healthcare to the local community, irrespective of where you live., through our developing family of skilled practitioners. We have a State-of-the-art facility, competent staff that happen to be dedicated to your comfort and care, and the potential to work within any budget. We provide great quality crowns and bridges for our paients at the lowest cost to you. As a preferred provider for your health fund we may help your insurance rebate increase for a claim. This may make your crown cost the lowest priced in Melbourne.